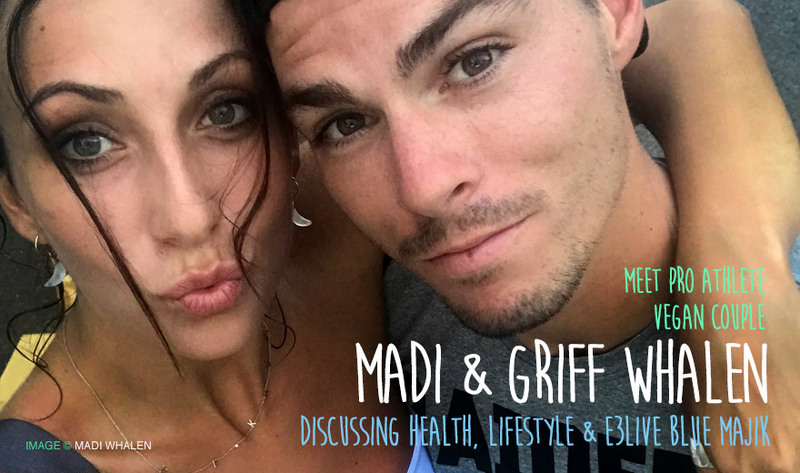 Plant-powered vegan couple Madi and Griff Whalen are both professional athletes who eat for performance, health and compassion. Madi is a pro triathlete and Griff is an NFL Wide Receiver. Together they share their secrets for LOVE, health, fitness, happiness and how Blue Majik helps with athletic performance. I have been racing as Professional Triathlete for about 8 years. I grew up racing and training for the sport since I was 12 yrs. My dream was to race as a professional. This year I have taken a bit of a change as I am trying to focus on building a strong base and focusing getting stronger through yoga by becoming a Sculpt yoga instructor as well practicing all types of yoga and doing strength and conditioning. I want to be able to race longer distances again but making sure I am healthy, strong and fit before I get on the starting line again. I am also very passionate about introducing people to a plant based vegan lifestyle to help with performance and health.I have been fortunate as an athlete and vegan influencer to share all of my experiences as a vegan athlete and as a women in her 20s. Griff went to Stanford University and played Football there and then to the NFL. 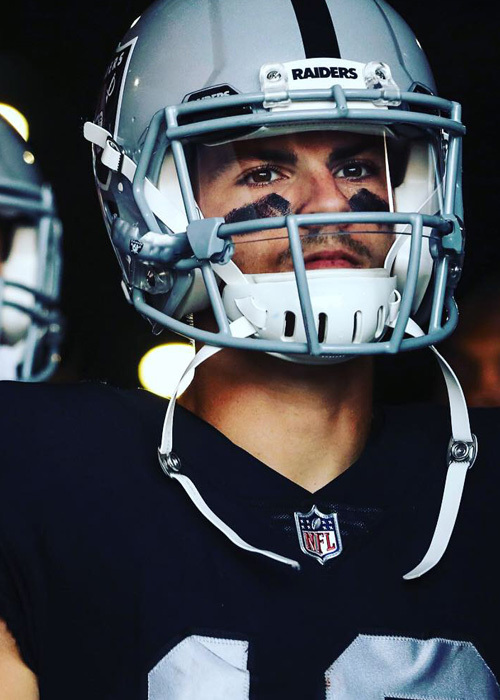 Last season he played with the Oakland Raiders. He got a foot injury and is currently a Free Agent. 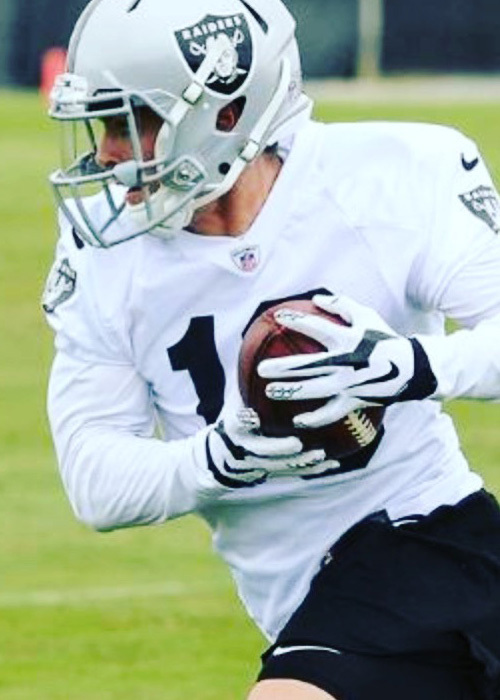 He has been in the NFL for 7 seasons. I’m his biggest fan as his wife! It was magic. I had posted a nutrition blog on Twitter and he liked it. I was fascinated that there was a vegan NFL player. We also had a mutual friend as a connection also. I was training in LA and he was playing for the Miami Dolphins. He asked me to dinner. He flew to LA to take me out. Fell instantly in love as soon as we met. When and why did you each become interested in a healthy lifestyle? Seven or eight years ago my whole family went vegan together. Best thing we’ve ever done. Griff has been vegan for about five years. We both love animals, but as athletes we both wanted optimal performance so we tried plant-based diets and it worked for us. Griff has so much knowledge and has done a ton of research and knows quite a bit about nutrition and what works for him. How do you maintain health while traveling? We travel a lot so we make sure we bring a lot of nutrition with us. It's so much easier now with so many Vegan restaurants and Juice bars and such opening up everywhere. We try to eat very few pre-packed processed foods. When we do travel we trying to stick to clean foods. We love Red Bars. They are a really simple clean bar that tastes great. Besides what you do professionally, what is each of your favorite fitness activity? Griff loves all and every activity. Because we live in California we are lucky to be in such an active place. We try to do a lot with our two rescue puppies Kona and Jaia. They come for hikes, running, rollerblading, they even come to play tennis with us. For breakfast we usually eat an Oatmeal called Stoked Oats or Chia Stoked Oats — these are easy to take with us when we travel. They have lots of protein, carbs, flax seeds and nuts. Then Griff adds hemp seeds and fruit and more nuts. For dinners we do a lot of veggie bowls. 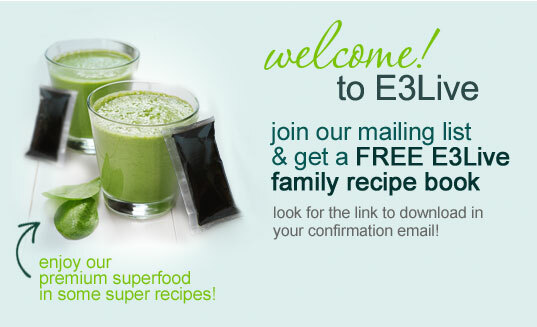 Which E3Live superfoods do you take and why? We both love the Blue Majik. We use a teaspoon in our smoothies post workouts. It really helps reduce our inflammation as pro athletes. We also love that it has vitamin B12, amino acids and antioxidants. It perfect to have a superfood with everything in one little spoon. 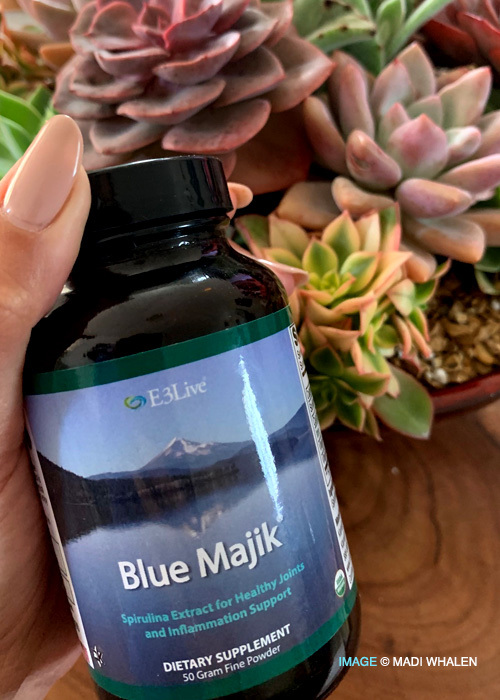 What is the difference in your overall athletic performance since you started taking E3Live Blue Majik? What did you notice first/overall and the most? Both Griff and myself have noticed an energy shift for sure and an improvement of focus and clarity during and after working out to continue our day. We both have lots going on inside and outside our sports so staying focused and healthy is super important to us. We love that we have an extra little advantage over other athletes by making sure our bodies are working more efficiently and with a faster recovery. What's your secret to healthy loving relationship? Not sure what the secret is. It's just pretty amazing every day. What are your #1 health and fitness tips? Fuel your body with whole food plant based food and products. Be selective with supplements and include superfoods in your diet like E3Live Blue Majik. It gives you an edge and boosts energy and most importantly helps with faster recovery. What's next for Madi and Griff? "Fuel your body with whole food plant based food and products. Be selective with supplements and include superfoods in your diet like E3Live Blue Majik. It gives you an edge and boosts energy and most importantly helps with faster recovery." 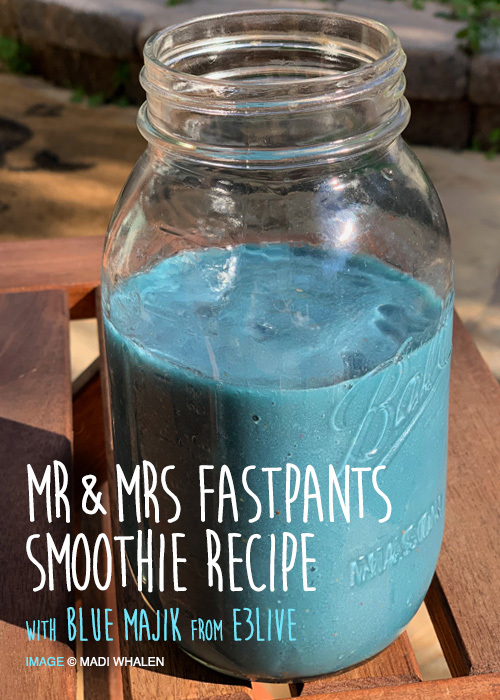 MR & MRS FASTPANTS SMOOTHIE RECIPE using E3Live's Blue Majik superfood spirulina extract. 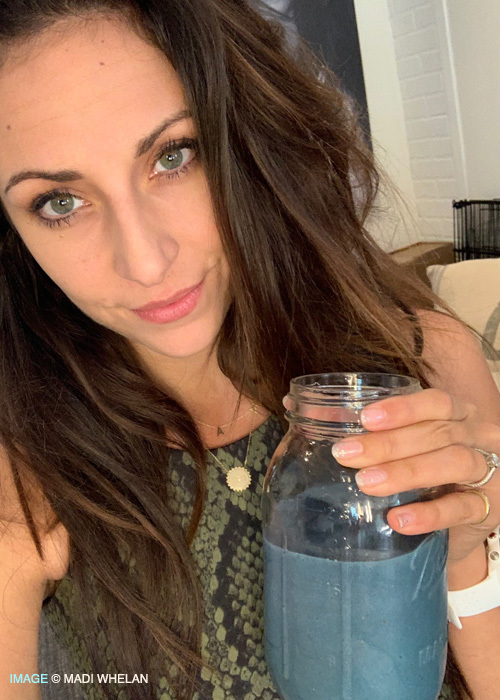 MADI WHALEN'S Blue Majik superfood spirulina extract.